It was a rough fourth quarter for many hedge funds, which were naturally unable to overcome the big dip in the broad market, as the S&P 500 fell by about 4.8% during 2018 and average hedge fund losing about 1%. The Russell 2000, composed of smaller companies, performed even worse, trailing the S&P by more than 6 percentage points, as investors fled less-known quantities for safe havens. This was the case with hedge funds, who we heard were pulling money from the market amid the volatility, which included money from small-cap stocks, which they invest in at a higher rate than other investors. This action contributed to the greater decline in these stocks during the tumultuous period. We will study how this market volatility affected their sentiment towards Parker-Hannifin Corporation (NYSE:PH) during the quarter below. Is Parker-Hannifin Corporation (NYSE:PH) the right pick for your portfolio? The smart money is in a bullish mood. The number of long hedge fund positions moved up by 3 recently. 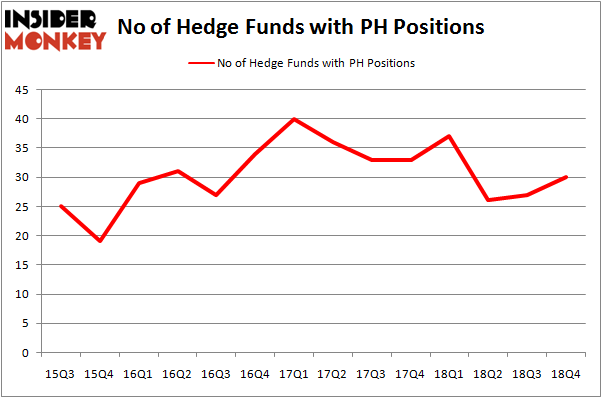 Our calculations also showed that PH isn’t among the 30 most popular stocks among hedge funds. To the average investor there are several methods stock market investors employ to analyze stocks. A pair of the most useful methods are hedge fund and insider trading sentiment. Our experts have shown that, historically, those who follow the top picks of the top fund managers can outperform the S&P 500 by a significant margin (see the details here). Let’s check out the latest hedge fund action regarding Parker-Hannifin Corporation (NYSE:PH). Heading into the first quarter of 2019, a total of 30 of the hedge funds tracked by Insider Monkey held long positions in this stock, a change of 11% from the previous quarter. Below, you can check out the change in hedge fund sentiment towards PH over the last 14 quarters. So, let’s see which hedge funds were among the top holders of the stock and which hedge funds were making big moves. The largest stake in Parker-Hannifin Corporation (NYSE:PH) was held by Diamond Hill Capital, which reported holding $245.3 million worth of stock at the end of September. It was followed by Two Sigma Advisors with a $59.6 million position. Other investors bullish on the company included Pzena Investment Management, Gotham Asset Management, and AQR Capital Management. Consequently, specific money managers were leading the bulls’ herd. Impala Asset Management, managed by Robert Bishop, initiated the largest position in Parker-Hannifin Corporation (NYSE:PH). Impala Asset Management had $18.7 million invested in the company at the end of the quarter. Benjamin A. Smith’s Laurion Capital Management also made a $8.7 million investment in the stock during the quarter. The other funds with new positions in the stock are Matthew Tewksbury’s Stevens Capital Management, and D. E. Shaw’s D E Shaw. Let’s also examine hedge fund activity in other stocks similar to Parker-Hannifin Corporation (NYSE:PH). These stocks are Willis Towers Watson Public Limited Company (NASDAQ:WLTW), The Clorox Company (NYSE:CLX), Waste Connections, Inc. (NYSE:WCN), and Tyson Foods, Inc. (NYSE:TSN). All of these stocks’ market caps are similar to PH’s market cap. As you can see these stocks had an average of 29.75 hedge funds with bullish positions and the average amount invested in these stocks was $1143 million. That figure was $514 million in PH’s case. Tyson Foods, Inc. (NYSE:TSN) is the most popular stock in this table. 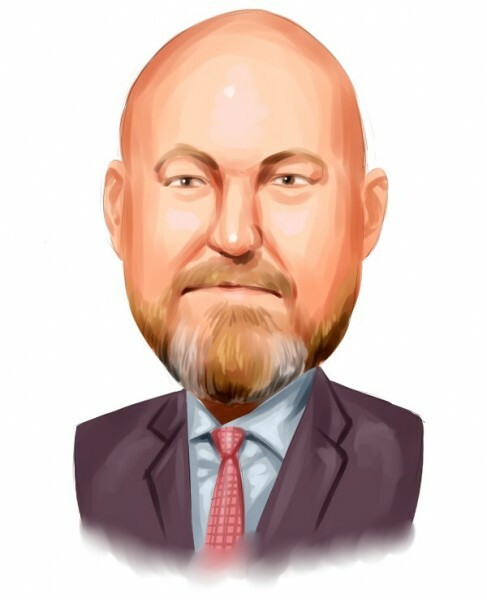 On the other hand Willis Towers Watson Public Limited Company (NASDAQ:WLTW) is the least popular one with only 25 bullish hedge fund positions. Parker-Hannifin Corporation (NYSE:PH) is not the most popular stock in this group but hedge fund interest is still above average. Our calculations showed that top 15 most popular stocks among hedge funds returned 19.7% through March 15th and outperformed the S&P 500 ETF (SPY) by 6.6 percentage points. Hedge funds were also right about betting on PH, though not to the same extent, as the stock returned 15% and outperformed the market as well.